In a southern Indian population of Asian elephants, I looked at the stable carbon isotopic ratios in bone collagen with the assistance of R. Ramesh of the Physical Research Laboratory at Ahmedabad. We had bone samples from 56 elephants that had died of various causes. The elephants ranged in age from newborn individuals to a 60-year-old adult female with sixth molars that had almost completely worn out. The carbon isotope ratios of the most common browse (C3 plants) and grasses (C4 plants) consumed by elephants averaged -27.2 per mil and -12.8 per mil, respectively (we corrected this by +4.5 per mil for relating to the values in bone collagen). 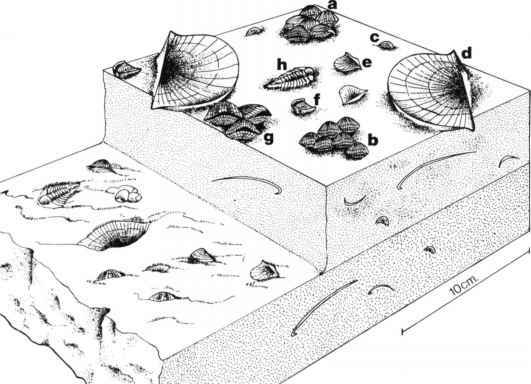 Several interesting patterns emerged from the bone isotopic analyses. 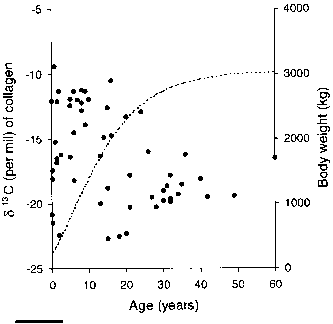 The carbon isotope ratios varied to a much greater degree in younger elephants compared to older individuals (fig. 5.3). Thus, elephants less than 25 years old had 8UC values from -10.5 per mil to -22.7 per mil, indicating a diet composed of 85% grasses in the former to their virtual absence in the latter case. Part of the reason for this wide range of values could be that the "isotopic signature" in younger, growing individuals is not stable because bone collagen is still being synthesized and replaced at relatively high rates. As an individual shifts its diet from browse to grass on a seasonal basis, the isotopic values also keep flipping back and forth. On the other hand, older elephants that had stopped growing showed values in the range of -16.0 per mil to -20.3 per mil, suggesting that their isotopic signatures are more stable. younger elephants compared to -18.6 per mil for older elephants. This suggested that carbon from browse plants contributed about 50% of the total carbon in younger animals, while this figure was just over 70% in older individuals. That younger elephants ate less browse was corroborated by my direct observations of feeding habits of the elephants in this study population. When averaged over the year, the younger elephants spent only 42% of their time feeding on browse (the remaining 58% being spent in feeding on grass), while the older elephants spent 50% of their time browsing. Perhaps it is easier for older elephants to reach out for branches from trees, strip bark, and browse than it is for the younger ones. An even more important aspect of dietary nutrition emerged from the study. Even though adult elephants spend only half their time browsing, the browse or C3 plants contributed over 70% of the organic carbon that went into the synthesis of collagen. Thus, the browse plants provided proportionally higher quantities of protein used in the growth of the animal. This is again con sistent with the differential crude protein content of browse (range 3%-26% dry weight) versus C4 grasses (range 1.5%-10%) for food plants consumed by elephants in this region. Added to this, there may be differences in digestibility of grass versus browse leaves, the former being highly siliceous, fibrous, and unpalatable during the dry season. The elephants of this southern Indian population have access to a variety of vegetation types, from semievergreen and moist deciduous forest to dry deciduous and dry thorn forest. The home ranges of several adult bulls and family groups studied cover virtually this entire diversity of habitats. Although a certain degree of dietary variation among elephant clans and solitary bulls exists due to constraints imposed by their spacing patterns, individual preferences, and home ranges, the 55%-83% range in protein contribution from C3 plants to adult elephants brings out the importance of browse in the overall diet. Similar isotopic studies in several African elephant populations also show the importance of C3 plants in their diets. A survey of carbon isotopic ratios in elephants from a wide geographical African range by Nikolaas van der Merwe and coworkers showed a simple linear relationship between tree density and <513C values (or proportion of C3 plants in the diet). As expected, the diet of elephants in rain forests, such as in Sierra Leone and Liberia, was 100% C3 plants. After all, in the near absence of C4 grasses, elephants would have no choice but to browse on trees and shrubs or feed on C3 herbs and palms. What is surprising is that even in the drier habitats such as the bushveld savanna of Kruger in South Africa, where C4 grasses are plentiful, the C3 plants contributed 97% (range 80%-100%) of protein to bone collagen. C3 plants also contributed 65%-85% of the diet in elephants inhabiting other dry regions with C4 grasses, from East Tsavo in Kenya to mopane woodland in Malawi. When isotopic data from various African and Asian elephant populations are related to rainfall (fig. 5.4), it is clear that C3 plants constitute virtually 100% of the diet in African regions with high rainfall (>1,500 mm/year). In regions with lower rainfall, there is lot of variation, but a broad positive relationship between rainfall and C3 plants in diet can be seen.